When people think of Ferrari race cars, they think of Formula One. When people think of Ferrari race cars with fenders, they think of the classic Ferrari 250 and its ilk. When they think of modern Ferrari racers, they might think of cars like the Ferrari FXX K. We need to think more about the Ferrari 333 SP. 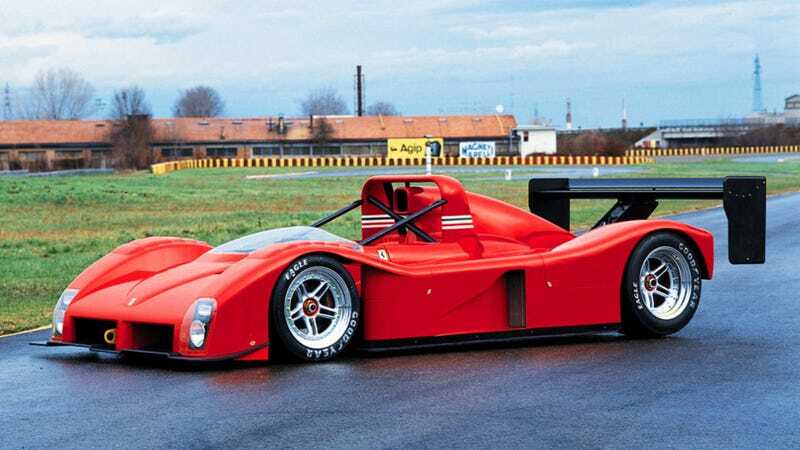 Weirdly for a Ferrari race car, Ferrari didn’t develop the chassis. That effort was done by Italian race company Dallara, which is now known for building the cars for everything from IndyCar to Formula E. That meant Ferrari built the engine, but what an engine it was. Derived from the V12 in the Ferrari 641 that won six races in the 1990 F1 championship, the 4.0-liter mill was an absolute screamer. Official numbers from Ferrari peg it as squeezing 650 horsepower out at a sky-high 11,000 RPM, for an astonishing 163 horsepower per liter. That’s all without a turbocharger, all while spitting monstrous flames out the back. The compression ratio alone was a simply ridiculous 13:1, which might not sound like much compared to some race engines today, but the car debuted in 1993. The 333 SP had remarkable staying power in true competition, with its last race in anger coming an absurd ten years later at the 2003 500 Kilometers of Monza. Alright, so it didn’t finish, and the Ferrari V12 had been swapped out for a Judd V10 by that point. But that’s all beside the matter. Just entering into a race with a decade-old car is a feat. You still see old rich guys driving these things around from time to time, and each instance is a blessing.